1. Follow TED-Ed on Instagram. Join other learners in the @tededclubs Instagram community, where we’re celebrating students — one big idea at a time. 2. 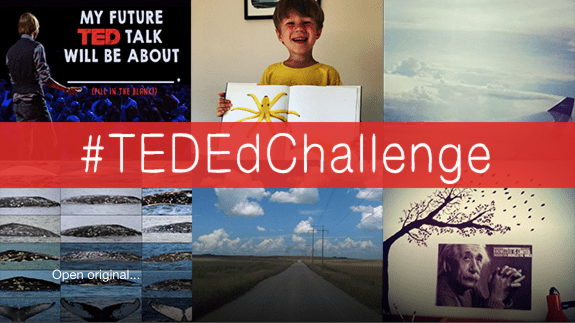 Enter the first #TEDEdChallenge. If you were to speak at TED, what would you talk about? To enter the challenge, share a visual answer to this question with the hashtag #TEDEdChallenge. Feel free to submit your idea on Instagram, Twitter or Facebook. You might even win a prize! 3. Get inspired by other ideas. On Monday, October 26th, we’ll choose one winner at random to receive a super special TED gift bag. What will this inspiring idea be? Zainab, you nailed it with that comment. A good teacher is able to step aside and allow students to soar. However at times, the best lessons end up flowing from student to teacher. You possess a wisdom and courage to share this. Sadly, not all teachers hold their students best interests at heart, or have been empowered to do so. It also takes courage to admit, that as teachers, we don’t know everything, but if wise, we are at all times willing to learn. Perhaps it will be you that leads a whole group of teachers to this bigger understanding. My future TED Talk would be: Why Art is important to students, how it helps mental health and self esteem. My future TED talk would be about Antoinette Carvajals Observatory Skate and the possibility of learning through an Immersive environment incorporating music,activity, 3d Holograms without glasses with a curved overhead K2 production of The Natural Sciences and our Universe. The outcome is to absorb more data exponentially. Learning while Observing, doing, and listening.